Wollongong isn't all about rock n' roll, y'know. No sir'ee, Bob. When we're not out rockin' n' raisin' hell we like to sit back in our comfy chair with a ice-cold glass of homemade lemonade and listen to our favourite local choirs. And there have been few better choirs from our region than Kiama Girls' Choir. 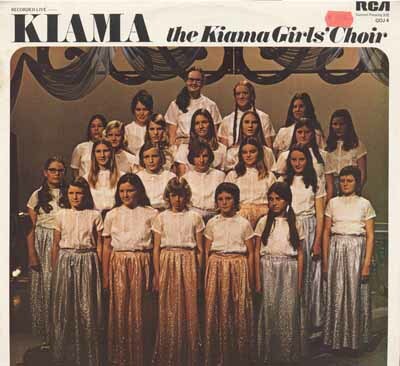 Founded in 1970 by music teacher Dina Patton the Kiama Girls' Choir was ably assisted by Erwin Smith - a local playwright who fancied himself a conductor. Meanwhile Christine Patton and Elizabeth Creagan provided piano accompaniments and Gaye Robinson, a typist with a solicitor's fim in Wollongong, sang soprano. Greg Patton - Dina's hubby - drove the girls to their gigs. The choir achieved great success prior to releasing this album (though the release date is unknown, and it would've been 1972 or later according to the liner notes), having twice gained first place in the City of Wollongong Eisteddfod. The choir also performed two recitals in Wollongong, appeared on WIN 4, sang in stores at Christmas time as well as the Kiama Pavillion. 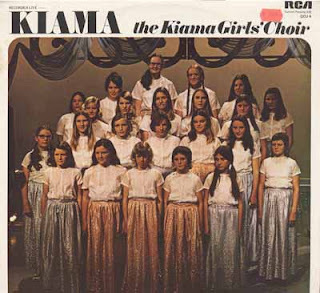 Kiama was recorded live at Wollongong Baptist Church and released by The Gems of Joy - a locally-based missionary-styled music group - on their eponymous label. Thanks goes to Mr Snookles at Third Island blog where this little curioso was stumbled upon.